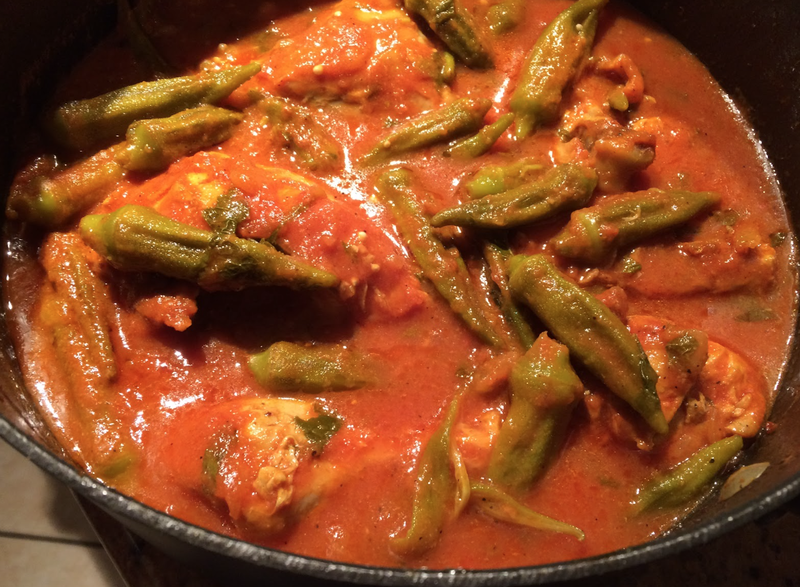 Indian Jewish sweet and sour stew with okra. The origins of this stew are from Iraq with a hint of Indian spice. Sautee the onion in oil. Add ginger, garlic, turmeric, pepper, salt, and chicken. The chicken needs to be room temperature. Add enough water to cover the chicken and simmer for 10-15 until the chicken is soft and all the water has dried up. Add the okra, tomatoes, lemon juice, sugar and 2 cups of water. Continue cooking for 15-20 minutes or until the okra is cooked. Lastly, add the mint. Add salt to taste. Note: This can be cooked with sliced beets or pieces of pumpkin instead of okra. Serve with hot rice. Indian Jewish cooking has been passed down from generation to generation. Bamia Khatta is one of my favorite dishes that my mother makes. My mother and her parents were born in Calcutta, India. However, her grandparents were from Iraq and Germany. The Indian Jewish cuisine originated in Baghdad, and blends many spices and flavors of India into many delicious dishes. Many of the dishes that Jews from India make have a Middle Eastern flare. Typical Indian Jewish dishes are mahashas (vegetables stuffed with rice and ground chicken), aloo chop (mashed potato balls stuffed with ground chicken or vegetables) and aloo makalas (whole fried potatoes), which was created by the Indian Jews of Calcutta. This style of cooking was brought from Baghdad to three main Jewish settlements in India – Bombay, Cochin, and Calcutta. The employment of Indian cooks had a heavy influence on what the Indian Jewish community calls Indian Jewish dishes. While learning how to cook Middle Eastern food from their employers, Indian cooks introduced their local spices and ingredients. Many Hindus are generally vegetarian, which made these dishes adaptable with “kashrut”, or Jewish dietary laws. Because of this, Indian Jews have adopted a range of different typical Indian foods such as dahl (lentils), paratas (flat, flakey bread), bhajis (spiced vegetables) and tandoori chicken. Indian Jewish cooking consist of a variety of unique dishes which are not only enjoyed by those brought up with these recipes, but also by those who are strangers to them. This looks delicious! I am definitely going to try out this recipe. Thanks Jessica!